SOS Project Safe Haven volunteers come from all walks of life and with this comes life experience, skills and enthusiasm. We are committed to providing equality and diversity for every volunteer. Volunteers care about their community and the people within it. We value our volunteers and their involvement, without which this project would not have grown and developed over the years. Volunteers form part of a core team and complement existing staff by working in partnership and enabling skills to be passed on. Volunteers don’t have to take on duties they feel are unrealistic, beyond their current scope, that they do not have the skills or experience to deal with or makes them feel uncomfortable. It is in these situations the more experienced staff and volunteers are there to provide support and guidance. Many volunteers feel that they grow and personally develop as a result of situations they deal with, increasing their understanding and confidence. Some training is provided in-house while other training requires volunteers to travel and be dedicated to attend formal courses. Some courses provided are via E-learning. As a result of volunteering on the SOS Project Safe Haven, a number of individuals have gone on to gain employment. This has included door security, managerial roles, Emergency Care Assistants and student paramedics. As a volunteer you also have the opportunity to volunteer as a Community First Responder with the East of England Ambulance Service to provide additional support within your own town during your spare time. All training is provided by the East of England Ambulance Service and regular training is also provided. This role involves preparing and distributing tea/coffee/soup and water to individuals within the night-time economy. 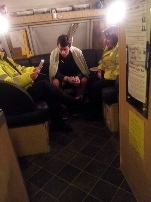 It helps support those who are vulnerable to the cold and can be offered from the unit as well as around the town centre. This role involves patrolling the town offering outreach services within the community. 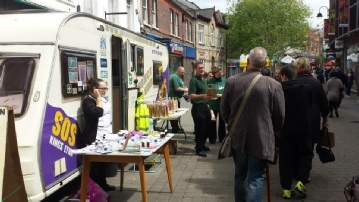 This could be in the form of information and advice, providing first aid, removal of alcohol paraphernalia from the streets, engaging with individuals about support services available and referral pathways. This role is more demanding and requires additional training in order to fully support an individual’s needs. This role involves working from the unit providing a number of free services. This role is about engagement with passers-by and identifying services to meet their needs. This might include providing flip flops for someone walking barefoot, clothing to help someone stay warm and dry, condoms and other sexual health information, and distribution of needle exchange packs. This role involves looking at ways to support the SOS, arranging events that help raise funds such as car wash days, bingo events, charity runs. This role requires self-motivation and organisational skills. Why not get in touch and let us know which role interests you. You must be 18 years of age to be able to volunteer. You must be able to get to and from the SOS project safely. You must have access to a vehicle or have suitable means of transport to be able to be dropped off and picked up at appropriate times. All volunteers will undertake an enhanced DBS check. All volunteers are provided with a green polo shirt and high-visibility jacket. During winter months appropriate clothing will be provided. Basic refreshments are provided during shift.